This hut is an NZFS six bunker that was built in 1968. It has no open fire or stove. There is still an NZFS era kerosene cooker there though. Water supply is from the river. Top Waitaha as the name implies is toward the head of the Waitaha River. It is on the TL of the river in a tussock basin. It's a great setting. It is in easy country compared with the rough river travel further downstream and the tops above it. Not many trampers get to Top Waitaha but it is worth the effort. There are various tops routes to it that have high points on them of over 2000m which require good weather and a few alpine skills or the up valley ordeal on a route that has long stretches of rough track and boulder hopping. 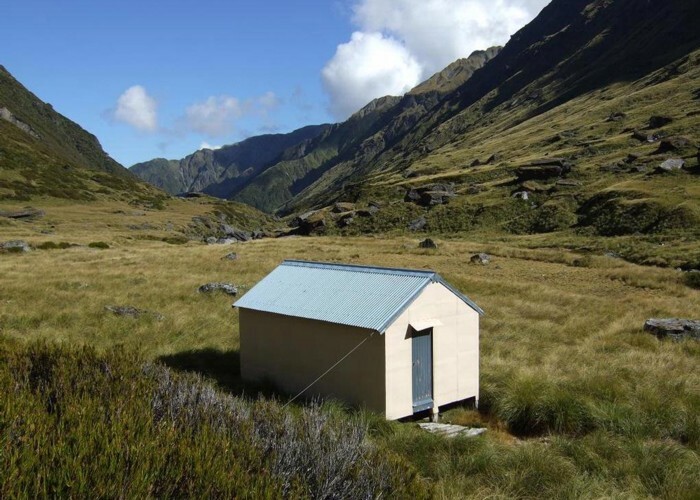 Top Waitaha hut March 2012 • By glennj. Licence: C.
*See the Top Waitaha hut page on the Permolat site for more detailed route notes. Added 5 April 2012 by glennjglennj. 2 revisions, most recently 8 April 2012 by glennjglennj.